There is now a winner of the Drifting House giveaway..! 12:30pm: Ooh! Time to pick a winner! 12:40pm: Wait. Too early. The drawing ends at 1:00pm. 12:45pm: Last minute tweet urging people to enter the giveaway. 1:15pm: Ooh! Time to pick a winner! 1:16pm: Seriously. Why did only 4 people enter this giveaway? It never ceases to amaze me how some books get 70+ entries, and others less than 10. Please buy this book. I’m so happy to give away a copy of Drifting House! And stay tuned, because I’m interviewing Krys for the upcoming March issue of Kartika Review. Krys Lee: A world where no one is in need, which is in theory a communist society, and we all know how that turned out. 2. What do you consider the most overrated virtue? KL: I think accomplishment and intelligence are overrated. Many an accomplished person has committed acts of atrocity. These virtues gain more value when paired with generosity and compassion. 3. If you could choose what to come back as, what would it be? KL: I’d come back as a human rights activist, a park ranger in a wilderness area with elk and moose, or a sea turtle in a protected tropical cove. So let’s get to the heart of the matter: the giveaway! 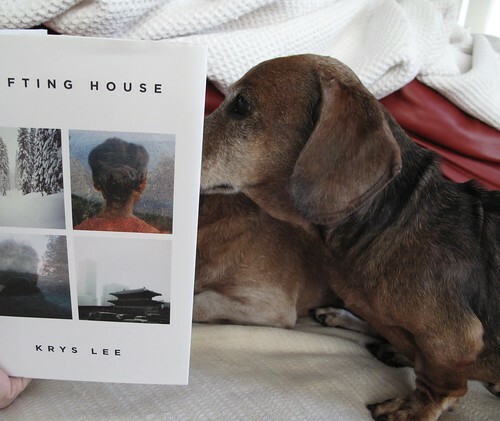 I’m giving away a signed copy of Krys Lee’s short story collection. You can see a copy of the book in the photos of my “wiener dogs reading books.” The collection is debuting in hardcover (as you see here, though you will get a non-doggie copy) and it will be signed by the author. 1) Leave a comment below. You can say anything you want–e.g., you can choose to tell me why you want a copy of the book, or tell me something about your homebase/s in life, or write down your favorite short story collection. Do fill out your email address when you fill out the fields in the comment box (it won’t be published to the world, but I will need it in order to contact you in case you win)! 3) The giveaway is open worldwide. 4) If you win the contest, I will email you for your mailing address. 5) Winners will be chosen by a random number generator. 6) I will be announcing the contest winner on the blog. None of your personal information will be posted, aside from your first name and last initial (or the nickname you choose to list in your comment). If you see that someone else has entered the same name as you, please try to pick a different nickname to call yourself, so as to avoid confusion. 7) If you are below the age of 13, please ask your parents to fill out the comment field with their information. The deadline to enter a comment is Wednesday February 8, 2012 1:00pm EST. The winner (picked at random) will be announced February 8, 2012 by 9:00pm EST. Update: The winner is announced!